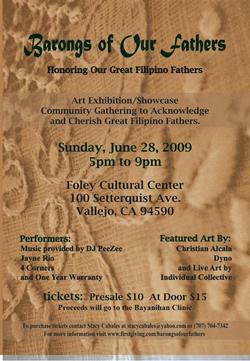 Stacy Cabales created the art and music festival “Barongs of our Fathers” to honor and acknowledge Filipino fathers, to be held June 28th at the Foley Cultural Center in Vallejo, California. Created as her project in the Self-Expression and Leadership Program offered by Landmark Education, Cabales decided to have the event be fundraiser for The Bayanihan Clinic, a Sacramento clinic that provides culturally and linguistically sensitive primary care to the underserved Filipino population, particularly World War II Veterans and recent immigrants. The Vallejo-based Times-Herald newspaper wrote an article about the upcoming event. When Stacy Cabales’ grandfather died in December 1999, she felt guilty for never truly appreciating the 81-year-old World War II veteran. “I didn’t acknowledge him for the person that he was,” said Cabales, 23, a Jesse Bethel High School graduate. A decade later, that desire to honor her late grandfather has evolved into Barongs of Our Fathers, an art and music festival that Cabales has cobbled together in a few short weeks. The festival is designed to honor Filipino fathers and veterans. A barong is a traditional male formal garment in the Philippines. Cabales, a Cal State East Bay kinesiology student, is part of a leadership seminar, and Barongs of Our Fathers is her project for the class. “Those first couple of weeks, I got totally overwhelmed,” said Cabales, who began working in earnest on the festival in April. During her stint at Bethel, Cabales described herself as focused mainly on athletics, but otherwise uninvolved and uninterested in her community. Now, she has enlisted the aid of that same community, bringing together a crew of local artists who will create pieces that will be displayed alongside statements about their fathers. Among those are members of the Individual Collective, an eclectic group of young artists who have a gallery at 419 Georgia St.
“It’s really just a little spot where you can come in and kick it and stay out of trouble,” said Nico Rafael, 23. Rafael, also a Bethel alumnus, now lives in Fairfield. Participating artists also include Christian Voltar Alcala, the son of legendary Filipino comic book artist Alfredo Alcala and a Vallejo resident. The festival also will feature local performing talent, such as Jayne Rio and 4 Corners. All the proceeds from the festival will benefit the Bayanihan Clinic, a Sacramento clinic that caters to Filipino World War II veterans — like Cabales’ grandfather. She was introduced to the clinic by friend and fellow Bethel alumna Maria Olandria, who works there. Cabales hopes to raise at least $5,000 for the Bayanihan Clinic. Events like Barongs for Our Fathers and the regular open nights at the Individual Collective Gallery promotes participation, which in turn nurtures leadership within the community, Rafael said. Cabales stresses that, while organizing the festival, the event does not belong to her, but to the whole community. “For the first time in my life, I’m being so … selfless,” Cabales said.